There’s been a lot going on around here. There always is. Never a dull moment. Always something happening. And with My Cowboy’s sense of humor, it’s usually fun, or at least funny! Our Amish friend, David, came down to help out around the place a couple days last week, so My Cowboy got to do what he does best — boss someone around. Luckily, David is young and strong and full of energy, so even though My Cowboy couldn’t help as much as he wanted to, David just ignored all the bossing and got the job done. He built us some new gates, repaired and built fence, and did some major repairs in our barn. This will hopefully prevent my seeing cows run past the living room window in the future. Then he came inside and started the demolition of the wall we’re tearing out between two of the upstairs rooms so that my studio can be finished. However, they ran out of saw blades and time, so he’ll be back later to work on that some more. I’m just happy to have it started. We’re further along than we were last week! Here’s My Cowboy, making the first cut. He’s not really supposed to run tools like that, though, so he passed it off to David to continue. I took my camera and left when it got too noisy and dusty. Guys love demolition! When we signed up for internet service here at the house when we moved in, the phone company gave this to us for free! 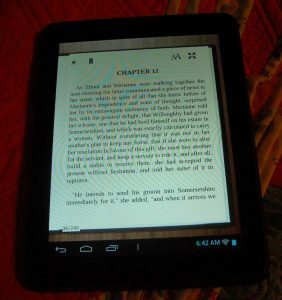 I thought My Cowboy might like to use it, but he hates it, so before he decided to fling it through the dining room window, I confiscated it, and my friend, Pat, showed me how to read books on it, and I’m perfectly happy with it for that purpose! I’ve also been working on another of my old UFOs. But I’ll post more on that later, when I’m closer to done . . . or maybe all the way done, if I accomplish more than I expect. Mostly, I’ve been quilting customer quilts. And recently, one of the customer quilts I quilted appeared in a magazine! Opposites Attract, by my pal, Victoria Findlay Wolfe, appeared in Issue #59 of Quilter’s Companion, an Australian magazine. You can click the link to see more pictures of it, being modeled by the oh-so-adorable Jenny Egg. I love this quilt, and really want to make one for myself. Think it would make a dent in my scraps? I got my Peace Quilt finished. I chose a scrappy binding in the end, simply because it was what I had. I had some stripes, but not enough of any one, and I auditioned black, but it was just too harsh. I didn’t have enough of the orange left, so scrappy it became. But that’s OK, because I like it! 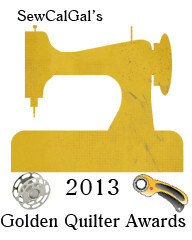 If you haven’t yet, you need to go vote in the 2013 Golden Quilter Awards. It’s not easy, but you have a chance at prizes just for voting. That’s all the news for now. Thanks for checking in! What’s happening in your neck of the woods? That is a beautiful quilt and I love the clam shells you quilted it with. I also like that scrappy binding on the peace sign quilt. I like scrappy bindings. The scrappy binding is great! I was interested to see the behind-the-wall construction in your house. I saw that in houses from the late 1800s and early 1900s in Washington State when they were rehabbing an historical house. Is your house in that vintage? Yeah, demolition is good. 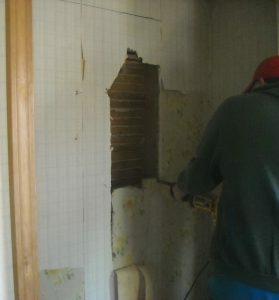 My bathroom is totally torn up. I bet it’s a year before it’s done. LOL. Weekend project, the book says. Ha! 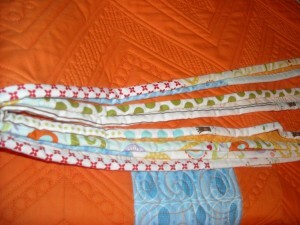 I love the scrappy binding. That is terrific! Victoria sure is getting some publicity right now! 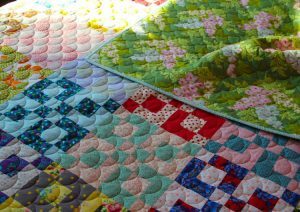 The clam shells quilting design looks great on that quilt!…as does the scrappy binding on your quilt! I hope by now your room is done….I have waited patiently for ten years for the completion of two rooms that need just this and that before flooring can be laid and the bedroom and a sewing room are done……..but I am thankful I still have a home and it is warm. When I look at all the people who have had tragedies my daily sewing in the dining room seems less of a burden.